Introducing the New Torus Power PB 5 | Northmar, Inc. 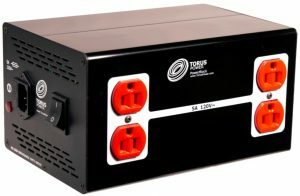 The Torus Power PB 5 is a 5-amp Torus Power toroidal isolation transformer with a compact footprint and rugged construction. The PowerBlock PB 5 was designed for use in compact systems and to power source components, TVs and projectors. It’s ideal for situations where you want to isolate digital components from analog equipment or segregate switching power supplies from linear power supplies. The PowerBlock PB 5 is an ultra-compact and portable toroidal isolation power transformer and the most affordable product in the Torus Power lineup at only US $799.00 retail. The PB 5’s compact footprint and rugged construction make it convenient for use in almost any situation. It looks sharp on or near a component shelf, on any floor surface or it can be located elsewhere when space is at a premium.